[S283] 1900 US Federal Census, Troy, Rensselaer County, New York, digital image Ancestry.com ; National Archives micropublication, Francis Male head of household, Ward 11, roll 1153, enumeration district 0098, page 6B. [S5364] Mdebd, family tree titled "Doran Mercier Family Tree", published by Ancestry.com, www.ancestry.com, from database named 33980525, viewed Mar 2017. [S280] 1910 US Federal Census, New Haven, New Haven County, Connecticut, digital image Ancestry.com ; National Archives micropublication, Frank Male head of household, Ward 11, Roll T624_139, enumeration district 0429, page 17A. [S289] 1920 US Federal Census, New Haven, New Haven County, Connecticut, digital image Ancestry.com ; National Archives micropublication, John F Nichols head of household, Ward 12, roll T625_193, enumeration district 386, page 7B. [S285] 1930 US Federal Census, New Haven, New Haven County, Connecticut, digital image Ancestry.com ; National Archives micropublication, Mary Nichols head of household, roll 278, enumeration district 0102, page 27A. [S5366] 1940 US Federal Census, New Haven, New Haven County, Connecticut, digital image ; National Archives micropublication, Harry Male head of household, roll T627_543, enumeration district 11-182, page 8A. [S511] Phil Dascola, family tree titled "John Root", published by Ancestry.com, wc.rootsweb.ancestry.com, from database named philsged, updated Feb 2012, viewed Oct 2012. [S3958] 1940 US Federal Census, Other Places, Hidalgo County, Texas, digital image Ancestry.com ; National Archives micropublication, Charles Sargent head of household, roll T627_4062, enumeration district 108-14, page 14A. [S4020] Find A Grave: Highland Park Memorial Cemetery, Weslaco, Texas, Martha Sargeant Hendrick, created by Ken Saylor Jr, added Aug 2006, memorial number 15563135. [S511] Phil Dascola, family tree titled "John Root", published by Ancestry.com, wc.rootsweb.ancestry.com, from database named philsged, updated Feb 2010, viewed Dec 2009. [S3981] Find A Grave: Forest Lawn Memorial Park, Omaha, Nebraska, Gladys Kouns Tuttle, created by Sue Rush; Marvin & Samme Templin, added Jul 2011, memorial number 73056823. Funeral services for Mrs. Hazel I. Epperson, 54, 924 Avenue C, will be at 2 p.m. Thursday at the Woodring Chapel. The Rev. Norman Fonss, Lutheran minister and chaplain at St. Joseph's Hospital in Omaha, will officiate. Interment will be at Walnut Hill Cemetery. 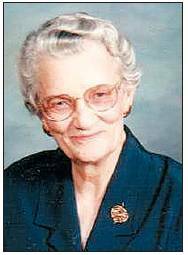 Mrs. Epperson died Monday at an Omaha hospital. Husband, Harry H.; two sons, Robert E. of Omaha and Howard L. of Council Bluffs; father, Edwin A. Tuttle of Omaha. Five sisters, Mrs. Florence DeErcol, Mrs. Mildred Henning and Mrs. Lois Miller, all of Omaha, Mrs. Charlotte Johnson of Worthing, S. D., and Mrs. Lila Van Middendorp of Sioux Falls, S.D. 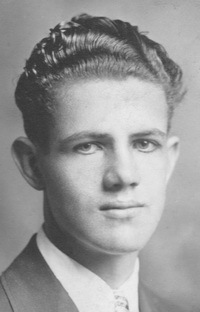 ; brother, Morris Tuttle of Santa Clara, Calif., and four grandchildren. [S2872] David J. Van Middendorp, family tree titled "Family of David J. Van Middendorp", published by Ancestry.com, wc.rootsweb.ancestry.com, from database named airwings, updated Nov 2012, viewed Nov 2012 , date=17 Jun 1957, incorrect. [S3981] Find A Grave: Forest Lawn Memorial Park, Omaha, Nebraska, Florence May D'Ercole, added by dolph72, date May 2009, memorial number 37066460. Edwin Russell Tuttle, 19, of 2014 North Nineteenth Street, was killed early Wednesday when the car in which he was riding turned over in a ditch a mile and a half west of Lexington, Neb., on the Lincoln highway. Homer E. Callen of Denver, owner of the car, and an unidentified man, also a passenger, are in the lexinton hospital. Their injuries consist of cuts and bruises. neither is in serious condition. The accident happened about 4 o'clock. authorities believe Callen lost control and was trying to maneuver the car back on the highway when it overturned. Tuttle, a graduate of South High school last year, was returning home from Denver. he told his family he had obtained a job driving one of a fleet of new cars to Denver for a local Chevrolet concern. it was thought he was hitch-hiking home. He was the son of Mr. and Mrs. Edwin A. Tuttle. Besides his parents, he is survived by six sisters, Mrs. Al Tolboe, Hazel, Mildred, Charlotte, Lila and Lois, and one brother, Maurice, all of Omaha. Funeral services will be at the Leslie O. Moore mortuary here Saturday at 2 p.m. with burial in Forest Lawn memorial Park. [S3981] Find A Grave: Forest Lawn Memorial Park, Omaha, Nebraska, Edwin Russell Tuttle, created by Sue Rush; Marvin & Samme Templin, added Jul 2011, memorial number 73056818. 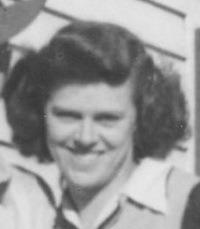 Mildred married Kenneth Dean Elder Sr. 30 November 1939 in Plattsmouth, NE. He was killed in the war. 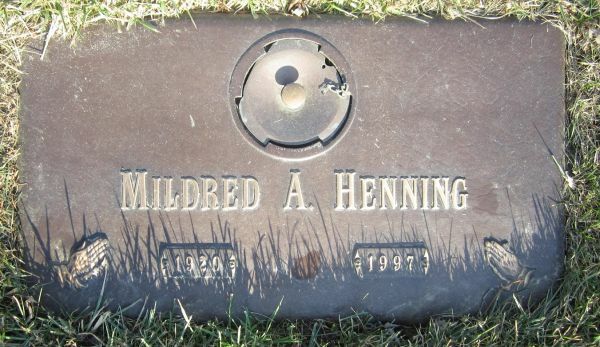 She and Edward Henning were married June 28, 1946 in Canton, Lincoln County, South Dakota. 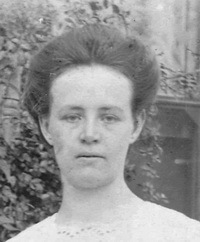 She was listed as Mildred Arlene Elder, a widow, at the time of the marriage.